Why Does My Roof Have Black Streaky Looking Stains? - Eby Exteriors, Inc.
Home » Roofing » Why Does My Roof Have Black Streaky Looking Stains? My roof is only 17 years old but it has black “streaky” looking stains all over it, especially on the north side (the side facing my street of course!) What exactly are these stains, and how can I get rid of them? We’ve all seen it, those dark black streaks on a roof. Sometimes they look more like ugly blotches than streaks, but either way, they don’t do a lot for the appearance of a house. The black streaking and staining are actually algae or fungal growth. It begins when a small spore lands on your roof and takes up residence. Over time it often spreads and grows. 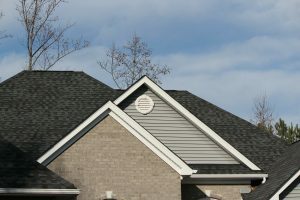 Typically, you’ll notice the staining on the north-facing sides of a home or on roof sections that get a lot of shade. However, it is not necessarily limited to those areas and I have seen it many times on south-facing, sunny roof sections as well. This type of staining seems to have become much more prevalent in the last 10-20 years in our area. Some say that this can be attributed to the increased use of crushed limestone as filler in roofing shingles. The calcium carbonate in limestone supports algae growth. In most cases, using a safe manufacturer-recommended cleaning solution, combine with a low-pressure rinse, algae stains can be removed from your roof without damaging the shingles. Your roof can actually look new again! The “ideal candidates” are roofs that are in fair condition or better. If your shingles have aged to the point where we feel that they may not be able to handle the low-pressure rinse, we won’t attempt to clean them, not to mention the fact that it may not be a wise investment if your roof needs to be replaced within a few years. Costs will vary greatly depending on factors such as; roof size, roof pitch (steepness), and degree of staining among other things. Also, we do not guarantee that the stains won’t return. However, in most cases, it took years for the black staining to grow to the level where it is on many roofs. If you notice new staining, it can typically be removed easily and inexpensively, without having to clean the entire roof. Another option is to install new zinc strips that will prevent new algae growth. There are thousands of homes with roofs like yours in our area—roofs that have lots of life left in them but that appear old, worn, and downright ugly due to algae staining. Cleaning roofs like this can be a great way to restore curb appeal. It’s also a smart idea for folks looking to sell their home. Even though the functionality of the roof may be top-notch if it appears worn out it can put a lot of caution flags into a potential buyer’s mind. If you’d like us to take a look at your roof to determine if it’s a good candidate for a roof cleaning, don’t hesitate to contact Eby Exteriors, Inc. We don’t charge for estimates and our roofing professionals will give you an honest answer as to the best course of action for your home.